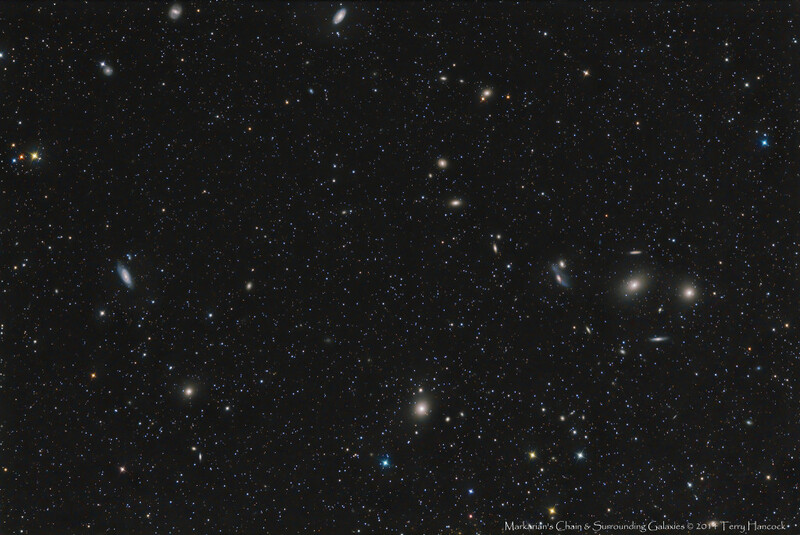 This wide-field image of the core of the Virgo cluster reveals several dozen of the more than 2,000 galaxies spread across our sky between the stars Denebola in Leo and Vindemiatrix in Virgo. The Virgo cluster, the largest nearby cluster to the Milky Way, is made up spirals galaxies, dwarf ellipticals, and giant ellipticals. The irregularly-shaped cluster is anchored at its core by the immense but featureless elliptical galaxies M84 and M86; the monstrous elliptical M87 is not far away. Arcing away from M84 and M86 are several more spirals and ellipticals in what’s called “Markarian’s Chain”. It includes the two interacting spiral galaxies NGC 4435 and NGC 4438, which are sometimes called “The Eyes” because of their appearance in a telescope. The image above was engineered by Terry Hancock of Downunder Observatory. This link has a zoomable image to help you find out which galaxy is which in the above image. Other spirals of the Virgo Cluster (not shown above) include the beautiful Sombrero galaxy (M104) and Black Eye galaxy (M64), as well as the underrated pair M88 and M90. In a telescope at high magnification this pair broods alone in your eyepiece, with almost no foreground stars from our own galaxy to spoil the view. The center of the Virgo Cluster is 60 million light years away. The cluster is concentrated in a patch of sky in western Virgo, some 8º to 10º wide. The big ellipticals gather near the center of the cluster because their mutual gravitational attraction holds them close together. The lighter and speedier spirals, on the other hand, are strewn in a filamentary structure away from the core of the cluster. In time, the spirals find their way towards the center of the cluster. Some astronomers think large ellipticals were formed from spiral galaxies that merged as they were pulled into center of massive galaxy clusters. The modest Local Group of galaxies of which we’re a part is now receding from the Virgo Cluster. But it may likely succumb to gravitational attraction and merge with this massive group in many billions of years. The Virgo Cluster, the Local Cluster, and many others galaxy clusters form a much larger gravitationally-bound structure called the Local Supercluster. There are millions of galaxy superclusters spread across the universe.